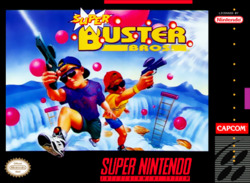 Super Buster Bros for Super Nintendo has you arm yourself with your harpoon and take on the bubble bad guys in a fight for the planet. As you start shooting the falling bubbles, you realize there’s a problem--every time you shoot a bubble, it breaks into two smaller ones. You’ll have your hands full as you move from level to level, blasting bubble after bubble, but be careful if one touches you, you’re a goner.